WCG (World Cyber Games), or the game Olympics as some call it, is the tournament that began in 2000, giving birth to the world’s greatest eSports star “Moon” (JangJayHo) and others. Unfortunately, WCG, which had been cheered on by millions of gamers, was discontinued in 2013. However, after a 6 year gap, the event world eSports fans have been waiting for will finally return in 2019. WCG is an eSports competition for nations to compete with one another. In 2000 with the support of Samsung Electronics, WCG provided the gateway for gamers to become pro, and provided for others the spectacle of watching top-tier games between legends. Beginning with StarCraft, a variety of titles were chosen for competition until recently, regardless of genre, such as popular titles such as DOTA 2 and Counterstrike. Then, much to the disappointment of gamers, 2013 marked the end of WCG’s short life. 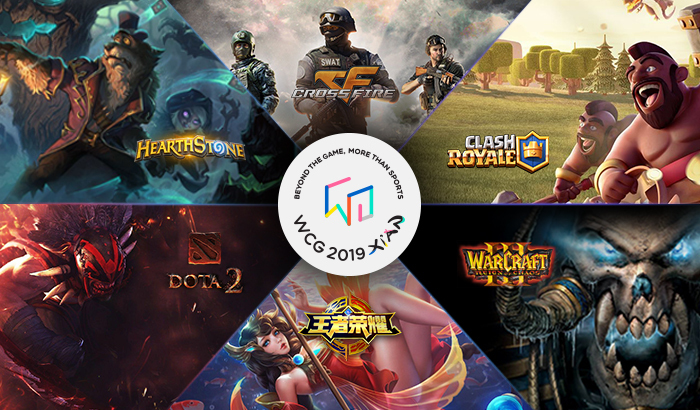 However, under the new slogan “BEYOND THE GAME, MORE THAN SPORTS” WCG 2019 has returned with new international gamers. From July 18th to the 21st, WCG will share not only eSports, but new technology, a music festival, TED talks, conferences and more in Xi’an, China. WCG 2019 Xi’an has 6 official titles. WCG MASTERS will progress with the target of global gamers. Preliminaries will proceed online beginning in March and from May athletes from each country will be chosen to represent their countries through offline qualifiers. There will be 4 titles to qualify for: DOTA 2, Warcraft 3, Hearthstone, and Clash Royale. WCG PREMIER will be restricted to Chinese gamers. From April online preliminaries will begin and from June the representative players will be selected through offline qualifiers. This competition is also excited to host the “All-Star Invitational” for the globally popular mobile game “Clash Royale” where the 2019 season 1 pro league champions will be invited. The regional qualifiers for Asian, European, and American gamers will be on the Battlefy platform, and the Chinese qualifiers will be held through the Varena platform. Applications for attending the qualifiers began March 12th, and many gamers have already been accepted. We hope those who wish to go pro or gamers who love their game do not miss this opportunity and hurry to offer their support. The Global Branding & Experiential Marketing Agency EIDETIC MARKETING is the official agency of WCG 2019 Xi’an and has been working with WCG on its development since being chosen last January. EIDETIC MARKETING is making every effort to make sure that the opening and operations of WCG are a success, managing everything from branding and space design to customer itinerary. EIDETIC MARKETING’s CEO Ashley S. Jung has stated that “WCG 2019 Xi’an is an important event to end WCG’s six year absence. It is an honor that WCG has allowed EIDETIC MARKETING to help present the best time for gamers awaiting the return of WCG.